REALLY Itchy Scalp After Drinking Alcohol? Why Do I Have a Really Itchy Scalp After Drinking Alcohol? » Why Do I Have a Really Itchy Scalp After Drinking Alcohol? Itchiness of the scalp can occur for many different reasons. Everything from weather to the products you use for your hair can be the culprit. But, have you ever thought about the reason why you have an itchy scalp after drinking alcohol? Maybe you’ve noticed it before – after a few drinks, your scalp becomes dry and starts itching. Perhaps it doesn’t hit you until the next day. Maybe you don’t even associate it with drinking wine or beer at the time. However, there is a connection between the two. Most people know there are several adverse effects that alcohol can have on the body. Usually, our scalp isn’t the first thing we consider. However, if you’re prone to a dry scalp, it’s important to know how alcoholic drinks can cause itching and dryness. 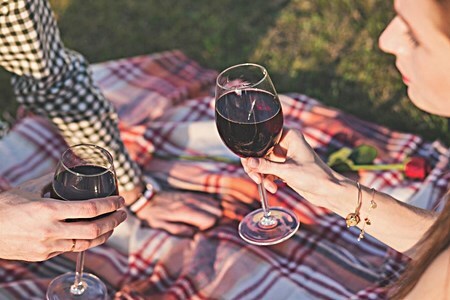 This article will cover exactly why alcohol and an itchy scalp are connected, and what you should consider before reaching for that next pint of beer or glass of wine. Does Drinking Beer Affect Seborrheic Dermatitis? Does Drinking Affect Hair Growth? Are Certain Drinks Better for Your Scalp? Will Moderate Drinking Cause Dry Scalp? There are several ways in which alcohol can affect the scalp. For this article, we’ll focus mostly on one of the most popular drinks, namely beer. However, many of the information stated here can also be said for liquors like whiskey and bourbon. Alcohol of any type is known as a depressant. Not only does it slow some functions of your body down, but it dehydrates you, as well. It’s that dehydration that often leads to unpleasant mornings following a night of drinking. Alcohol is also considered to be a diuretic. That means, it causes you to have to urinate more often and dehydrates your body even more. Even if you drink a substantial amount of water during the day, the effects of just a few alcoholic beverages can offset it completely. If you’re already prone to dry skin and notice that your scalp starts itching more frequently after you’ve consumed alcohol, it’s a fairly obvious connection. The skin on your scalp can dry out just as easily as the rest of your body causing an itching sensation to occur. Unfortunately, too much itching can lead to even bigger problems, like bleeding and infection. Another common theory as to what causes seborrheic dermatitis is yeast. Many doctors believe there is a specific yeast/fungus that occurs in the oil secretion of the scalp that can contribute to this particular condition. It’s why antifungal shampoos and medications are often prescribed as a treatment option for seborrheic dermatitis. Alcohols like beer (and whiskey, etc.) are fermented. In most cases, the fermentation process doesn’t cause any harm to the body. However, if you have seborrheic dermatitis, the yeast within the drinks may cause negative effects, or cause it to flare up. These are different types of yeast, of course, but it’s how the body responds to them that make a difference. There isn’t a ton of research connecting beer and seborrheic dermatitis as of yet. However, if you have the condition, anything fermented is likely something you should stay away from in large quantities. In addition to dehydrating the skin and scalp, alcohol also causes inflammation throughout the body. It also enlarges the pores, making it easier for them to become clogged and greasy, which can lead to itching of the scalp. Additionally, alcohol affects blood flow and can leave your skin looking and feeling unhealthy. You may not see the skin of your scalp if it’s covered with hair, but blood flow is altered there, too. It makes more blood flow to the surface of the skin, which can lead to feeling too hot, and itchy. Finally, every time you drink, you may be depriving your skin of the essential nutrients and vitamins it needs to be healthy. This includes Vitamin A. Vitamin A is necessary for your cells to keep renewing, so your skin stays supple. A scalp that isn’t getting the nutrients it needs can lead to dry skin, itching, and even other skin conditions if it’s not taken care of over time. While having an alcoholic drink or two isn’t going to inhibit hair growth, alcohol isn’t good for your hair, either. It dries out your hair the same way it dries out the scalp. While this won’t necessarily lead to hair loss, it can make your hair feel dry and brittle. If you drink frequently, it may even cause it to break, or cause you to develop split ends. Unfortunately, dry hair can also lead to dry scalp, if you try to treat it with the wrong products. Sometimes, adding too many moisturizing products to your hair care routine can cause a buildup on the scalp. Eventually, this can lead to itching and flaking. Drinking any alcohol excessively can have negative effects. However, a glass of red wine each day has been proven to have several benefits, as it contains antioxidants. Alcohol like wine and clear liquors are often better for your body (and skin) than things like beer, or alcohol with a high sugar content. Sugary drinks with alcohol can be just as bad as drinking excessively. When sugar breaks down quickly in the body, it creates instant inflammation all over, which can cause irritation. Many alcoholic mixed drinks can cause double the trouble for your skin and scalp. It’s common to mix certain types of alcohols with things like sodas, or energy drinks. Unfortunately, the caffeine in these beverages wages war on your skin, too. Caffeine is another type of diuretic. It can dehydrate your skin just as much as alcohol, creating problems. So, while drinking in moderation may be safe, keep an eye on exactly what you’re drinking, and try to avoid the types that can irritate your skin. Before trying to treat your itchy scalp, it’s important to determine what might be causing it. If you think drinking is associated with your itching, you can follow the tips above to help lessen the effects. If your scalp is still dry and itchy, try some of the following home remedies to help soothe it and alleviate the urge to scratch. Tea tree oil: A natural antiseptic, antibacterial, and antifungal agent. Tea tree oil can help to stop the itching sensation, and moisturize your scalp. If you have seborrheic dermatitis or dandruff, it can also work to kill any fungus on the scalp. Lemon juice: Lemon juice is a natural antiseptic. If your dry scalp is causing dandruff, fresh lemon juice can help. Apple cider vinegar: This neutralizes the pH balance of your scalp to help alleviate itching. It is also an anti-inflammatory and can kill yeast and fungus. Coconut oil: Almost no natural ingredient locks in moisture better than coconut oil. It will keep your scalp moisturized without feeling greasy, soothing the urge to scratch at your skin. Moderate drinking is the best way to go. Having a drink or two several times a week is much better for your body, overall, than heavy drinking once in a while. Overall, it shouldn’t cause your scalp to dry out and become itchy if you take the proper precautions. Keep in mind, however, that whenever you drink, your body becomes dehydrated. Even one or two alcoholic beverages can essentially strip your body of a lot of water. This affects every inch of your skin, including your scalp. It also takes away from the nutrients your body needs to stay healthy, and for your skin to have a glowing appearance. Using Christina Moss Naturals shampoo can help your scalp to recover. Alcohol can affect the appearance of your skin, making you look tired, older, and paler. Between inflammation and dry skin, there aren’t many good bodily effects. The most important thing to remember is to stay as hydrated as possible, whenever you choose to have a drink. You’ll be protecting your skin, your scalp, and your hair by doing so.